MTU ONSITE ENERGY GENERATOR SETS ARE AVAILABLE WITH MAIN LINE CIRCUIT BREAKERS FOR SHORT CIRCUIT AND OVERCURRENT PROTECTION OF EQUIPMENT AND PERSONNEL. Circuit breakers are 80% or 100% rated circuits that come manually or electrically operated. The molded case circuit breakers we offer are designed to comply with UL 489 and IEC standards. 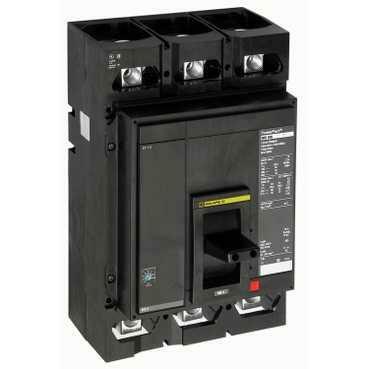 The standard circuit breaker for a genset is an 80% rated, thermal magnetic breaker. Electronic trip and thermal magnetic 100% rated circuit breakers are also available. A range of options and accessories are available including: terminal and lug options, phase barriers and lug shields, shunt trips, under voltage release, auxiliary and alarm switches, electrical operators, enclosures and handle mechanisms. The term “80% rated breaker” does not exist in any Code or Standard. Breakers are usually sized between 100% to 125% of the generator’s rated amps and the 80% rating is simply downsizing the breaker to comply with the 125% oversizing requirement for Continuous Loads in the National Electrical Code (NEC). When an output circuit breaker is not factory provided, an approved overcurrent protection device rated equal to or greater than the generator voltage with a current rating no more than 125% of the output current of the unit should be located within 7.6 m (25 ft) of the generator output terminals. Molded case circuit breakers are typically mounted in a circuit breaker enclosure directly attached to the alternator. The circuit breaker box may house single or multiple circuit breakers depending on the application requirements. Circuit breaker boxes may be top-entry or bottom-entry and must be large enough to accommodate large cables and provide adequate ventilation. Skid-mounted circuit breaker enclosures help reduce vibration stresses at the electrical connections and may also reduce cable bending requirements. Circuit breaker enclosures are available in General Purpose (Type 1), Dustproof (Type 12), and Rainproof (Type 3R) options. Dimensional drawings are available for all MTU Onsite Energy generator sets showing circuit breaker box locations and stub-up requirements for making the electrical connections. Selecting the right circuit breaker depends on the nature of the application. Standard breakers provide reliable operation for the protection of the generator set. In life safety applications, continuity of service is critical and selectivity, or only tripping the relevant circuit breaker, heightened reliability, and regular testing may be required. Mission critical applications require continuity of service with maximum reliability, redundancy, and compliance with regulatory requirements. Grid parallel applications and prime power applications require maximum reliability and availability with enhanced safety for operators and utility workers. Mobile generator applications, such as those used on job sites or for emergency response, require rugged construction, tolerance for diverse loads, and maximum safety for workers and passersby.